Reflecting on the #AgNerd Movement & So Many Benefits - JP loves LIFE! When milestones hit, sometimes you want to stop and reflect a bit…. that’s what this post is…. me taking time to look at the #agnerd movement on Twitter. It started for me about 40 months ago, but it began to come together a bit more three years ago this week. See, this week, #agchat celebrated its third anniversary and the AgChat Foundation celebrated its second anniversary. The organization that started as a grassroots movement was something a few farmers had been discussing for six to eight months before all the organizational structure, bylaws, etc were complete and we announced the creation of the Foundation. Most of us had become friends well before that and we had all learned a lot about how social media works, about tools to use and found success in connecting to other people we never could have met without social media. 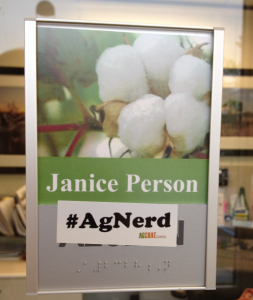 So proud to be an agnerd, I proclaim it at the office! We were thrilled to have had such a revelation in our worlds and sharing that learning with others was a goal. We’ve made incredible progress and certainly help further goal, but what I think is so incredible is all of the things that have been built from a community of people who sometimes put #agchat on their tweets and sometimes are connecting to other communities. To me, that’s where the real power of #agnerds comes into play. We are people using social media to tell our story, using technology to improve the environment on our farms and finding ways to do things better. And while we may have different ways of expressing our #agnerdness, they are all good! And in fact, some are freaking great! Americans like me are generations of living in the city. Its a part of my very being. I absolutely cannot imagine having grown up in the country even if I enjoy being there so frequently. Your childhood helps shape who you are in amazing ways. But so does the rest of the world around us. So today in cities like the one I call home, there are millions of people who haven’t spent time on a farm and yet the products produced there have always been a part of our world. My mom’s potato salad and ham. My dad cooking steak on the grill. My grandmom’s fudge pie and ambrosia. An great aunt’s famous caramel cake. My other grandmom’s cinnamon rolls. The things they knitted or sewed. These things are near and dear to my heart and although my parents grew some of our vegetables some years in a backyard garden, I didn’t know much about the farm side of food. I’ve been learning all about that since I was in college and getting on social media has given me a chance to put that learning curve on turbo. Now I have farmers names and faces to go with all those things as well as the many things I’ve discovered I love as an adult! Beef (and dad’s love of steak) is probably the community I learned the most about with Mike, Jeff, Debbie, Val, Troy, Robyn, Melissa, Ryan, Darin and countless others. Butter (LOTS OF IT THANKS) makes me think about how amazing it is that I’ve not only met a bunch of dairy farmers but both Ray and Annie invited me to their farms. There are lots more too Dino, Will, two Barbaras and the Zwebers. Wheat comes from Sarah, Mike, Tom, Gayle and more. And I hope that some of them have learned a tiny bit from this city girl who does public relations and has spent years learning about cotton and has become a champion for the natural fiber. As I gained confidence with using these tools and connecting to the ag community, I became more aware of the other communities in social media that really interested me. I’ve written about the incredible community of #BlogChat before, but I’m lucky enough to connect with the travel talk on twitter (#TTOT) crew quite often, #140conf, #gardenchat, #foodchat, #rdchat for registered dietitians, #rockinruralwomen connecting women across rural communities, multicultural families and more. And I really have to mention the welcoming of the #STL crowd…. I get to visit with folks online and in real life…. the kind of folks I can meet for happy hour or ask about a charity to support. These communities have helped me broaden my world further. Whether its blogging, travel, thinking more about the nutrition of food I eat or celebrating others stories & successes, social media starting with my ag friends has grown to be a part of my real world that gets me adventures on the road and at home. How awesome is that? It’s nice to have a little background info on these groups, for those of us still getting our feet wet. I agree blogging and social media is a great way to broaden our world. There is so much going on out in the world we can’t imagine or experience it all. But we can be exposed to the idea via our home computers. The communities and relationships we are building are also priceless.